Ramya Krishna and Devasena have wowed with their acting and looks in the movie. For any period film to taste success, a lot of factors contribute. One important thing is their looks. The looks should be so apt for their roles. Looks come out of clothing and jewellery. For period films, jewellery plays an important role as the characters are noting but kings and queens of huge dynasties. So their jewellery should be reflecting their position, character and also their attitude. Amrapali is the official jewellery designer partner for the film. Here are a few stills from the movie where the characters have got their looks intensified. 1. 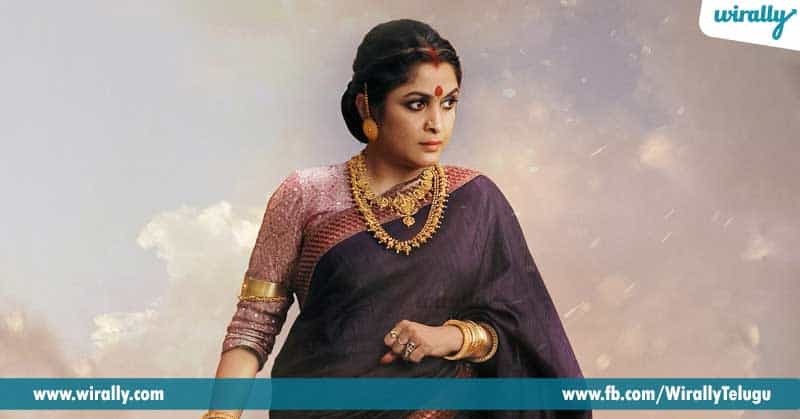 Ramya Krishna in antique look She is one of those elegant ladies in tollywood. She wore Traditional antique Lakshmi necklace, antique mini haram, antique gajjala vanki, antique earrings and antique bangles. These pieces have been apt for her role and the current attire. 2. Anushka in a simple warrior princess look She had a purpose to be fighting there and to get along with the scene, she was dressed in bright simple colors to improvise her entry and her jewellery made of plain gold to put an impact. 3. Anushka’s splendid attire including jewellery in this scene She is dressed in the most traditional and beautiful outfit. To give it a lot of attraction, her amazingly huge neck piece, vaddanam, jhumkis and those bangles have been designed so delicately to suit her attitude at that moment in the film. They are done with a lot of floral designs to make her ‘then-attitude’ a highlight. 4. Ramya Krishna Wearing that simple kasula maala and a black thread necklace, she looked really powerful and went on with the scene and her attire. 5. Anushka in a war scene She is made to wear a lovely simple saree and a hairstyle with simple jewellery in the form of earrings and mukku pudaka. She looked terrific in the entire scene!